Whether you're an experienced watch collector or novice, Matthew Bain, Inc. will help you maximize value when selling your watch. As a world-renowned international watch buyer, Matthew Bain's vast knowledge of complicated watches includes chronographs, moonphase watches, minute repeaters, and pocket watches. Matthew and his team of specialists focus on buying high-grade vintage and modern watches by brands such as Breitling, Rolex, Patek Philippe, Audemars Piguet, Vacheron Constantin, Cartier, FP Journe, A. Lange & Sohne and many others. Why Sell Your Watch to Us? Unlike your local jeweler or estate buyer, we're watch specialists who are up to date on watch market values. In fact, your local jeweler typically calls us for watch evaluations. By selling your watches directly to Matthew Bain, Inc., you eliminate the middleman and ensure that you receive top dollar for your watch. We'll pay premium prices for watches that are in mint condition and have the original box and papers. We're also willing to fly both domestically and internationally to buy important watches and collections. All our transactions are confidential, safe and secure. 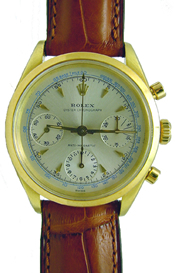 Other services we provide include watch appraisals, watch restoration and auction placement. Call 1-888-534-1680 to speak with a watch specialist about selling your watch or use our form to get started. Below are some of our preferred watch brands...the ones we tend to buy. Even if yours isn't listed, please feel free to contact us. How to Sell Your Watch? Buying and selling watches with Matthew Bain, Inc. is safe, secure and confidential. Typically, we need to physically see your watch to make a proper evaluation, but good quality photos can also provide us with an idea of your watch's market value. Once we determine the value of your watch, we may offer to buy it from you. We pay top prices for watches and provide immediate payment after we've established an agreement to purchase your watch. We'll promptly pay you by bank check, bank wire transfer, or cash. We can also accomodate other payment preferences you may have. Matthew Bain is well known and highly respected by watch dealers, jewelers, auction houses, and watch collectors all over the world. We want you to feel confident in doing business with us and are happy to provide you with the names and numbers of individuals in the watch industry who will vouch for us. Learn more about Matthew Bain. Ready to Sell Your Watch? Tell us as much as you can about your watch to receive our best offer.